The New 71 page Stocks Stealth Bull market Ebook for 2013 and Beyond is NOW available for FREE Download. This ebook follows on from the 10th of February publication of the time critical analysis and concluding trend forecast for the DJIA stock index for 2013, which comprised approx 28% of the ebook's content (Part2) as illustrated by the contents list below. 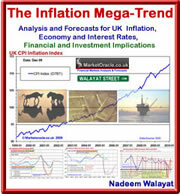 Part 3 of the ebook covers trading and investing strategies including detailed explanations of multiple waves of technological revolutions that are expected to wash over economies that imply that the stocks stealth bull market has many more years to run as well as affording readers a several years head start in terms of profiting from and greatly increasing personal productivity. Download Now- The Stocks Stealth Bull Market 2013 and Beyond Ebook (PDF 2.7meg). Part 1: Why a Stocks Stealth Bull Market? How Can the Stock Markets Keep Going Higher .....? You Want to Know the Future of Innovation? Have Central Bankers Saved the World? Central Banks and Governments Do not Understand the Risk of Ruin! Mortgages - Debt Till Death literally! Is the West About to Accelerate Away From the Rest?